Abstract: Just updated -- Try out Windows 8 by setting up an easy-to-use virtual machine in an existing PC. 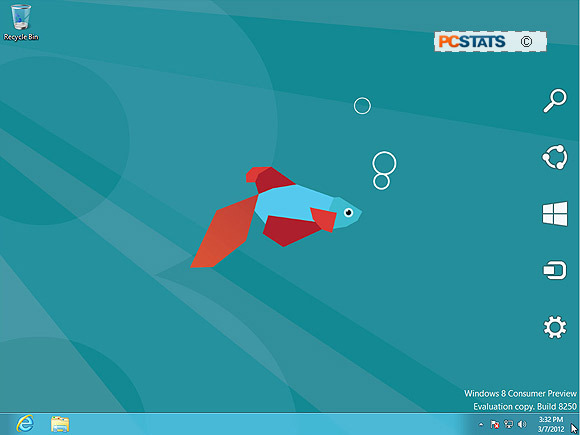 PCSTATS shows you how to create a Virtual PC, how to install it and where to tweak Windows 8. Upgrading to the latest and greatest operating system can be fraught with headaches; from incompatible software that no longer runs smoothly, to legacy drivers for legacy hardware that causes instability. An OS upgrade on computer hardware more than couple years old isn't necessarily a sure thing... it doesn't have to be a headache either. Before blindly upgrading an entire office of existing PCs into the unknown, most IT departments will roll out one trial system to test the new OS. This preemptive step allows IT staff to check the OS in the existing hardware environment with the already bought-and-paid-for software. With Microsoft Windows 8, testing before a mass roll out is a particularly important step to ensure software compatibility. It's also a pretty crucial step to give yourself time to get acquainted with the drastic user interfaces Microsoft has imposed. There are two ways to go about testing a new OS like Windows 8; 1) install the OS to a spare computer system and test away, or 2) install the OS to a virtualized PC. Since most people don't have a spare computer system of the exact same hardware build magically kicking around, we need to go the virtual computer route. In general terms, a virtual PC can be thought of as a computer system running in a virtualized environment, within a computer system. More than one virtualized environment can exist and each can have it's own operating system and applications, all running concurrently but separate from the host operating system. In real world terms it's sort of like starting a blank Word document, but instead of a window with a clean page to write on, you've got a fresh OS to work with. When you're done working in the Word document, just close the window - the same is true for virtual PCs. Since the whole topic of PC Virtualization can get rather complicated, rather quickly, PCSTATS is going to keep the focus of this Guide very specific. In this Beginners Guide, PCSTATS will show you how to create a virtual PC with Oracle VirtualBox v4.1.18 (it's free and very capable virtualization software) and then install Windows 8 Consumer Preview to that virtual machine. Now, normally we'd create a virtual PC within Windows 7 with Microsoft's default Windows VirtualPC software. However, in a rather ironic twist of fate it seems this application is incompatible with Windows 8. The steps outlined in this Beginners Guide are specific to configuring a Windows 8 CP virtual machine, but once you've done this you'll be able to apply the knowledge here to create a virtualized environment into which you can install just about any version of Windows. Once you know how to create a virtual PC within a PC, you'll find it's an amazingly versatile tool for testing different PC software configurations or even working around limitations with older programs and applications. Virtual PCs can be particularly handy if you rely on a piece of legacy software which only runs in say, Windows XP SP1, for example. For this Guide PCSTATS is going to assume you have a desktop computer system installed with Windows 7 and an Intel or AMD processor that supports x86 virtualization, plenty of memory and at least 20GB free HDD space. PCSTATS recommends at least 2GB RAM of system RAM since half this amount will be allocated to the Virtualized OS. To ease the transition from Windows 7 to Windows 8, Microsoft choose to release a free Consumer Preview of it's upcoming operating system a few months ago. In many respects Microsoft Windows 8 is not a huge departure from Windows 7, except for the 'Metro' user interface. 'Metro' is the radically different new opening screen that replaces the Start menu. At best, 'Metro' is a user interface suited to tablet computers and hand held computers. At worst, and within the realm of desktop computers, it's sheer bloody horror... if you haven't tried out Windows 8 for yourself, now's the time! The focus of this PCSTATS Beginners Guide will be two fold; setting up a Virtual Machine within a Win7 computer system and installing Windows 8 CP into this virtualized environment. Microsoft Windows Virtual PC client is incompatible with Windows 8 CP, but thankfully Oracle comes to the rescue with a powerful virtualization software tool that works. To begin, download the free Oracle VirtualBox 4.1.18 application from:http://www.virtualbox.org/wiki/Downloads and install the program. B) Windows 8 CP 32-bit (x86 / 2.5GB). Microsoft provides this Product Key: TK8TP-9JN6P-7X7WW-RFFTV-B7QPF, but you will also need a valid Hotmail email account for the final installation step.